Just out of curiosity. I'm assuming most are 30+. I would have created more options, but this was the limit the poll would allow me. EDIT: Poll updated by jacob.armitage. Thanks! Ripe old age of 25, young'n. If I was any older I'd have lumbago. Death is not very far now. I do. The poll didn't allow me to add more options. I swear, people don't read OPs. I mean, you could've used age ranges that were larger than 3 years. You could've changed your age brackets. More over 30 than 18-29 is pretty surprising. 20, will be 21 tomorrow. Wow, I am actually very surprised that most members are 30+ (who have taken the poll). I mean, im one of them, at 31, but I had always assumed that I was an outlier. 30+ era? what where the 80's like? OP is hunting for Runners. How should I know, I was born in 1988? I think we have a select few posters on here over 60. It was great, we did lots of cocaine and voted for Reagan . What was all you oldies first social media site/platform? Mine was Xanga. There are a maximum of 7 options, so just add 56-65 option. How’s it hanging! And I’m not asking about your balls. Why would you choose those age ranges lol? This poll is useless. I turned 36 a few days ago. 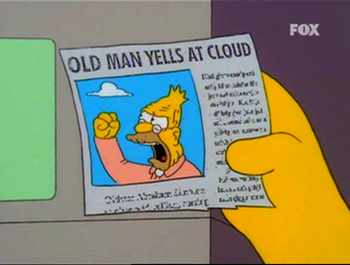 Yeah, I yell at clouds. Laughing at the 30+ category. 30 feels like a lifetime ago. 30 feels so YOUNG. 3 of my kids weren't even born yet. Candy cigarettes and big league chew. Everyone here being 30 or above would explain why every thread about rap turns into a dumpster-fire. Certainly explains what games get talked about. Would be interesting to do a thread like this on gaming side, I'm 24 btw.